BY MARCY SHORTUSE – The roster is filling up for the 2018 Ladies Day Tarpon Tournament, and fishing is scheduled to start at 4:30 p.m. on Saturday, May 12 in Boca Grande Pass. 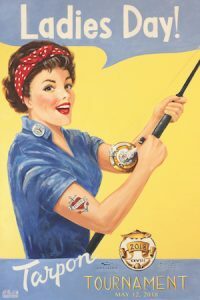 Each team consisting of a maximum of four anglers will be competing for a $1,000 first prize and jewelry, a second-place team prize of trophies and gift baskets, a third-place team prize of trophies and Osprey 2500 spinning reels and an individual angler award of a Boca Grande bracelet from Barbara Anne’s Jewelry and Repair. The first-place captain’s prize will be $500 and a trophy, as well as a pendant from Barbara Anne’s. The second-place captain will receive a trophy and a $75 gift card from the Barnichol. The third-place team captain will receive a trophy and a $25 gift card from the Pink Pony. Winners of last year’s Ladies Day included the first place team on Hey, Moma! with Captain Wayne Joiner and anglers Amber McGuiness, Lauren Swanson, Jodi Crabtree and Tracy Swanson. The second place team aboard Native with Capt. Frank Davis included Dondi Davis, Gail Davis, Kristi Davis and Kim Bellas. The third place team aboard Sundown with Capt. Timmy Smith included Joy Ferrell, Jackie Crowder and Joy Samsford. There were 28 total releases in the 2017 tournament. The fee per team is $600. Call the Chamber, 964-0568 for more information.